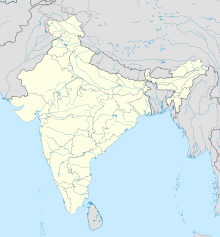 Kurnool Airport is an Airport at Orvakal in Andhra Pradesh, India. It is situated on east side of National Highway 40 (Kurnool-Chittoor Highway), 18 kilometres from Kurnool. The Greenfield Airport has been built by the Andhra Pradesh Airports Development Corporation Limited (formerly Bhogapuram International Airport Company Limited), a Special Purpose Vehicle (SPV) owned by the Andhra Pradesh Government that was set up in May 2015. Kurnool is one of the 50 Locations identified by the Central Government of India in 2013 for the development of low-cost airports in order to improve connectivity to remote areas. The airport will be spread over 639 acres, 456 acres of which fall under Pudicherla, 115 acres in Orvakal and 67 acres in Kannamadakala. The Indian Ministry of Civil Aviation (MoCA) had approved the Orvakal site in February 2016. The State Government Approved Allocation of Land in February 2017. The Chief Minister of Andhra Pradesh laid the foundation stone in June 2017, and the Airport work was completed in 18 months, with a trial of the Runway Successfully executed in December 2018. The Airport was inaugurated by the Chief Minister of Andhra Pradesh, Nara Chandrababu Naidu, on January 8, 2019. Commercial operations are likely to Commence in May, 2019 according to T.O.I (Times of INDIA). ^ "S.I.T.C. of NIGHT LANDING FACILITIES AT KURNOOL AIRPORT IN ANDHRA PRADESH" (PDF). ANDHRA PRADESH AIRPORTS DEVELOPMENT CORPORATION LIMITED. p. 8. Retrieved 2 February 2019. ^ "Pre-feasibility Report" (PDF). Retrieved 4 January 2019. ^ "SPV formed for Bhogapuram airport to speed up works". The Hindu. 21 May 2015. Retrieved 2015-06-23. ^ "Centre to focus on low-cost Airports along tourist circuits". The Times of India. 5 July 2014. Retrieved 6 February 2017. ^ a b "639 acres alienated for Greenfield airport in Kurnool district". The Hindu. 4 February 2017. Retrieved 6 February 2017. ^ "Centre gives nod for Nellore, Kurnool airport sites". The Times of India. 3 February 2016. Retrieved 6 February 2017. ^ "Orvakal airport will accelerate growth: Naidu". Evening Standard. 22 June 2017. Retrieved 4 January 2019. ^ "Trial run successful for Kurnool Airport". The Hindu. 31 December 2018. Retrieved 4 January 2019.